In life it is not always where you start, but more importantly where you finish and the commitment one makes to both family and community. There isn’t a better example of life’s evolving journey than Bank of America Western Region Senior Vice President Barry Simmons. For Simmons that journey which nurtured his character, honed his determination and inspired his spirit for diversity and many of life lessons began on a high school football field in New Orleans. He was a teammate of Cooper Manning, the elder brother of NFL super star quarterback Peyton Manning, who was a young unpolished quarterback during that time. A line backer on the field, Simmons went on to play at the University of Virginia and probably could have been one of the prestigious 1500 members National Football League club, but he’s among an even more elite group now. As an African American who holds the title of Senior Vice President of one of the world’s leading financial institutions, Simmons holds a status in the business community that is rarely achieved. “I want people to remember me as a leader who really cared about his people and who was really invested in their development,” said Simmons who is the Senior Vice President for Bank of America’s western region. His responsibility today carries more weight than a football player chasing down a running back or quarterback and puts him in a position to make life-changing decisions for families and individuals across Los Angeles. For Simmons, it started 17 years ago in the management development program for the credit card company, Legacy MBNA. During his time there he was allowed to rotate through all of the entry-level positions. Simmons started at telesales, outbound calls and collections then moved on to customer service and grave-yard shifts and the experience taught him to understand the people who he would eventually lead in his position at Bank of America. His experience at MBNA was a great character building exercise and, more importantly, it was a great opportunity to understand how to lead by making an emotional connection instead of by authority. Simmons main focus is how Bank of America can stay connected to its customers. While some see Bank of America as a large corporation, Barry works with his team to ensure that customers build relationships with the financial advisors at the banking centers to ensure that our community is aware of the variety of product offerings at the bank. This is especially important as banking becomes more digitized. Barry and his team are focused on customer service and have continued to add key specialists to help customers through life’s major financial decisions. 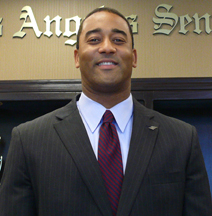 Simmons’ unique approach to an automated dominated industry that can lack a personal connection, has been instrumental in BOA increasing its share of customers in Los Angeles’ diverse communities. Simmons works with his team to foster a sense of connectivity. He has made it a point to get down to the ground floor and out to the different banking centers every week for at least three days a week to make sure that his team is delivering to customers what they want and need. His teams also hold customer feedback sessions in bank centers monthly. “We bring customers into a conference room and we just talk about their experiences, real life experiences that they’ve had with Bank of America, whether it is banking center specifically or any other experiences,” he said. Besides making life better for the bank’s customer, Simmons says Bank of America is also committed to financial literacy throughout Los Angeles. The bank recently launched www.BetterMoneyHabits.com to help consumers develop tools to help manage their personal finances. Bank of America has partnered with the National Foundation of Credit Counseling to hold financial seminars in select banking centers throughout Los Angeles. The seminars will be hosted after hours and the content will be focused on helping consumers to better simplify and manage their finances. There are upcoming financial seminars at Brotherhood Crusade on June 12th, and at banking centers on MLK/Western and in Compton on June 11th and 13th. “We want customers from the time they get their first savings account, to their first job, to retirement… the life cycle. That’s the kind of relationship we want,” Simmons said.